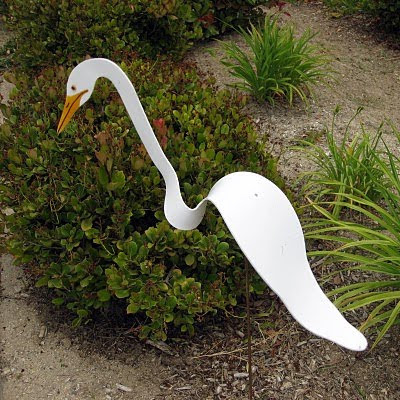 This egret is my new "yard art". I bought him from a neighbor, who re-sells them from his friend in North Carolina. Watch the short video below to see how he moves and bobs with the breeze. You can check out more photos of yard art, here. My quick glance at the thumbnail gave me only the impression of a white stripe. I had to come see. I love her! Maybe if I had a flock of them the deer would bypass our yard...just thinking. That is so cool. Going over to the link to check it out. What an awesome ornament! I'll have to investigate so I can have one too!